Pictured, from left to right, are Leigh Morris (CEO of NLBC), Luke Harmer (Digital Manager at NLBC), Sarah Purdell (Programme Development Manager at NLBC), and Liz Burkinshaw (Manager of Rural Innovation Centre at Stoneleigh Park). A new national ‘virtual college’ to champion skills development for land based industries has launched a digital hub from its base in Warwickshire. The National Land Based College (NLBC) at Stoneleigh Park has gone live with a new website which will be central to achieving its aim of improving workforce skills and promoting careers within the sector. It sets out the NLBC’s strategy to promote the land based sector as a professional and progressive career, increase industry engagement in the skills agenda, develop qualifications to deliver the skills employers need, and maximise digital and flexible learning opportunities. The site also enables people registering with NLBC to be kept up-to-date with careers, education and training and professional development information within farming and industries connected to the land and environment. The NLBC has been founded as an employer-led virtual college to help address the need to improve workforce skills and the industry’s overall quality and productivity. It will work closely with land based industries and 30 member specialist land based colleges and universities operating from 67 campuses across the UK, their membership organisation Landex and awarding body partner City & Guilds. Since being formally launched by George Eustice, Minister of State for Agriculture, Fisheries and Food, at the House of Lords in May last year, a core team of four headed by CEO Leigh Morris has established an office within the Rural Innovation Centre at Stoneleigh Park. 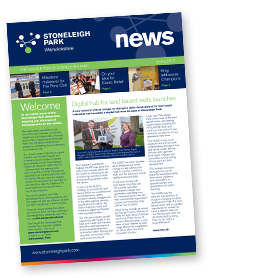 Stoneleigh Park is the heart of the land based sector with leading organisations including the NFU, AHDB, BALI and Lantra on site and so it was central to our plan to run our operations from here. The NLBC is very much employer-led and will work collaboratively through a hub and spoke model, linking industry with specialist land based colleges and universities and providing a focal point for skills development. The website has been developed as a go-to place for land based skills, from career guidance and information on apprenticeships and qualifications to online teaching. The NLBC has the potential and ambition to be game changing for skills development within the land based sector and is a golden opportunity for industry to have a massive steer on how training and skills are developed and by doing that, we can make a huge difference. With its strong association with agriculture and other land based industries, Stoneleigh Park is a natural home for the NLBC. The Rural Innovation Centre provides a serviced office for its core team from where the NLBC has the potential to make a tremendous impact within the land based sector.